Why do you need leather conference chairs at all? Leather conference chairs are specifically designed to be used in meeting rooms, conference rooms and other areas where your guests or clients accompany you and you need to make a first impression. Considering the fact that during meetings and presentations you need to be seated for longer hours without breaks, you should ensure that your seating arrangements are absolutely comfortable. 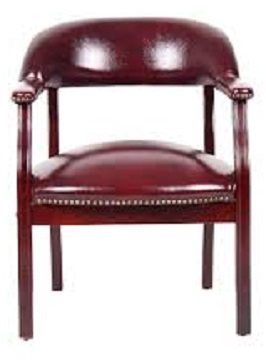 You will need chairs that are not only sturdy but also ones that make your guests feel at ease. Ergonomic leather conference chairs can not only enhance the aesthetics of your conference room but also prove more durable in the longer run. 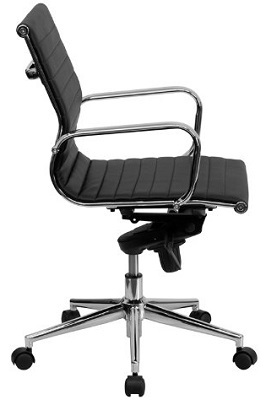 What are the obvious advantages of leather conference chairs? They enhance the aesthetic appeal of your conference or meeting rooms. 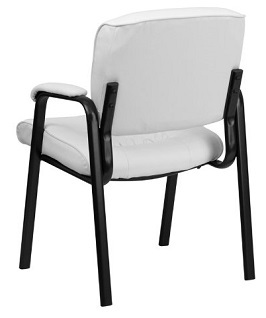 They are durable in nature and will last longer than other chairs. 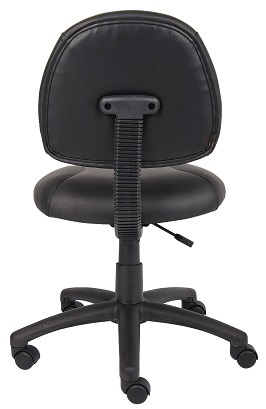 Ergonomic chairs help in maintaining the right posture. Your guests and clients will not end up with aching backs at the end of day. They look professional and give your conference rooms a swanky look. 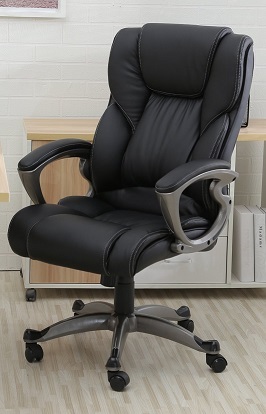 What are the disadvantages of using leather meeting room chairs? Leather upholstery tends to be sensitive to stains of any kind. Once stained, they can be quite difficult to clean. They are also very prone to getting nicks and cuts and if there are pencils and pens around, accidents can and will happen. Leather meeting room chairs are quite heavy and not too easy to shift from one place to another. 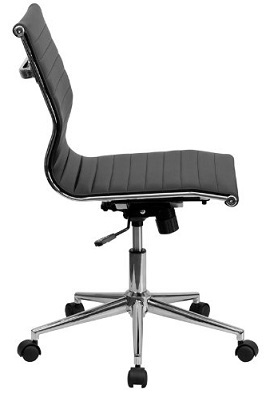 Why will I buy a leather conference chair and not anything else? You might wonder why buy a leather conference chair and not look at the other options available, which is a very valid question. There are a number of reasons to choose this type of furniture and not others. Your conference room is the place where you and your board members will host some of the most important meetings of your company. Needless to say, you would want to invest in the best of class furniture that fills up the space meaningfully. You will find conference chairs and tables in a variety of style and quality, but when you look at leather chairs, they will come across as functional, highly comfortable and aesthetically appealing. Considering how leather is looked upon as a classic choice, there is no doubt that in comparison to other upholstery, there is a sense of tradition and class around it. Hence, when you choose a leather conference chair, you are stepping forward and making a strong statement about your company. 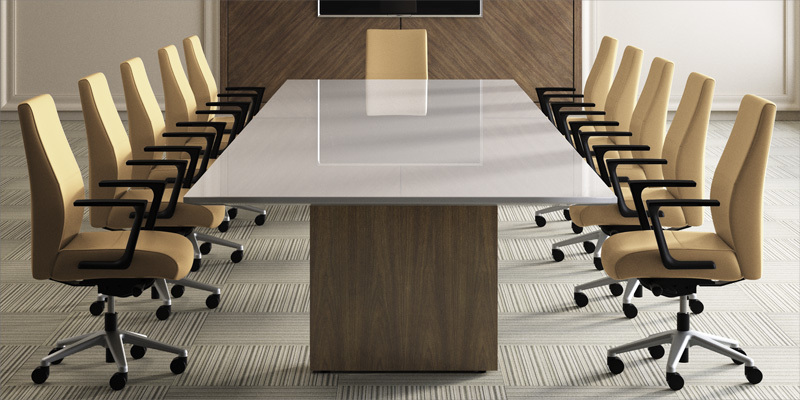 What kind of price can you expect to pay for leather conference table chairs? Leather conference table chairs are available in a wide range of prices. While you can buy executive swivel chairs for around $160-$170, the more expensive ones can go up to $500-$550, depending on the kind of features they offer. If you are looking at a short-term investment because your office décor needs frequent modification, you should pick the mid-ranged ones. If this for a long-term add-on, the more expensive chairs with better features made of more durable material should ideally be your choice. 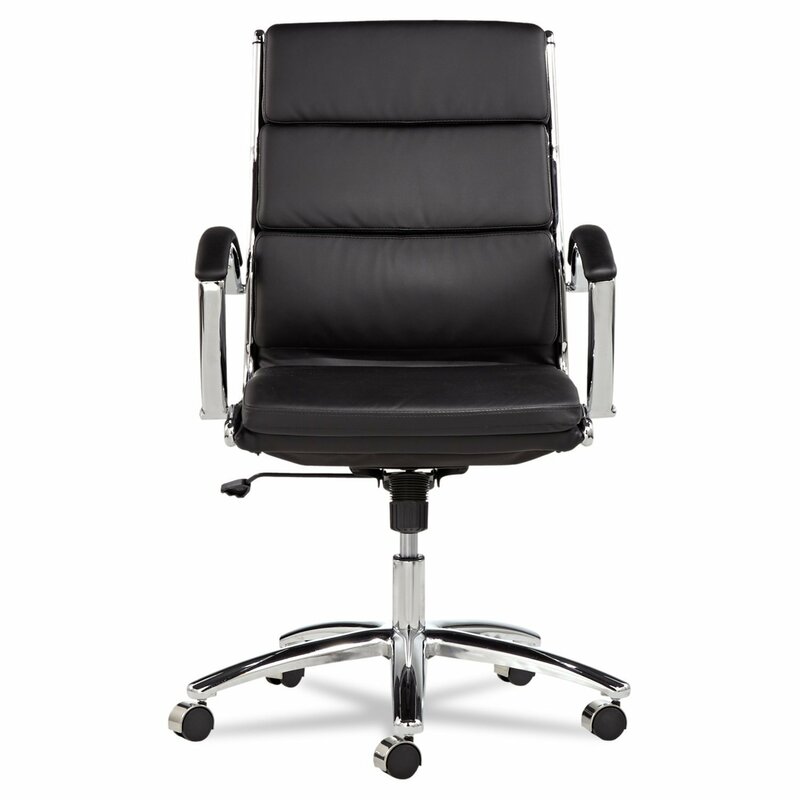 What are the most popular types of leather meeting chairs that you could opt for? This kind of chair enhances the modern décor of your office. A high back chair with a plush leatherette seat, this kind of chair not only looks stately but is also functional in nature. 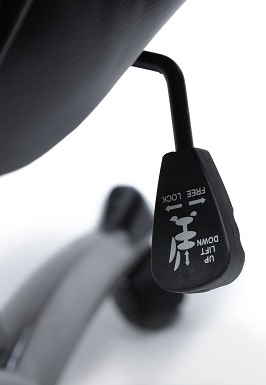 While the seat height can be adjusted as per the user’s preference, it can also be tilted and swiveled in different directions as well as locked in the most preferred position. This type of chair does not compromise quality and comfort while keeping a sleep look. They generally come along with caster wheels for easy mobility and height adjustment level to select a preferred seat height. 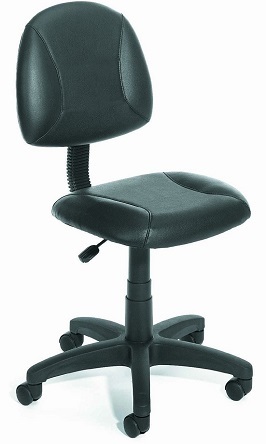 The backrest is usually quite comfortable but might not be as easy to use for longer stretches as the high-back office chairs are. This category of chairs is perfect for your everyday office use with its mid-back feature offering considerable back support, tilt control mechanism letting you choose your preferred position and a seat swivel that lets you move around 360 degrees while working on it. If you have always wanted to add a touch of style to your usual conference room, then the Mid-back Black Ribbed upholstered leather chair from Flash Furniture will be your finest choice. Considering how the molded seat has an inbuilt lumbar support system, there is no doubt that this will also add the much-needed comfort to never ending hours at board meetings. 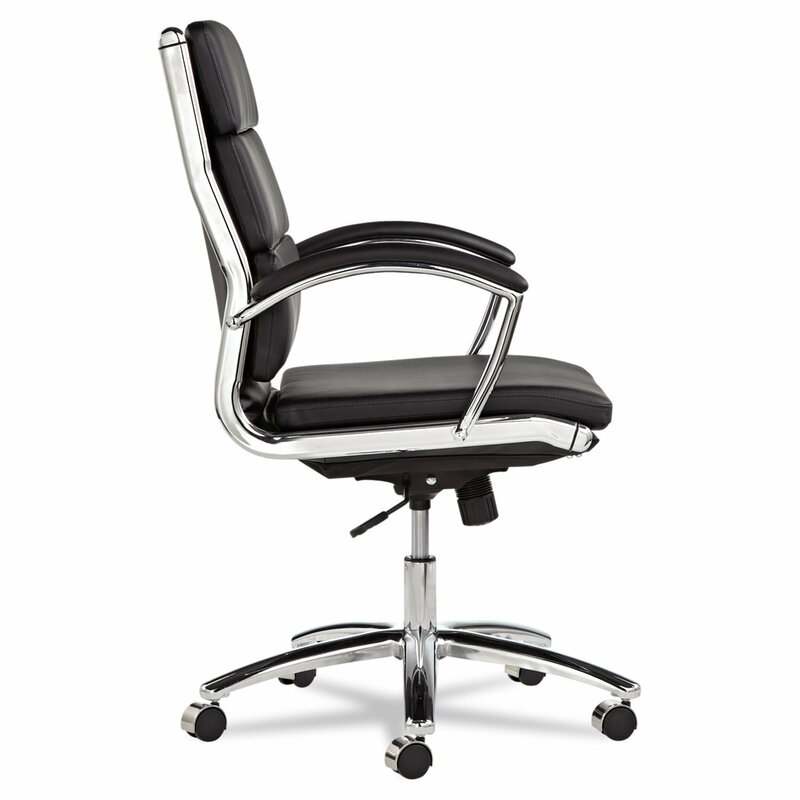 The locking tilt mechanism ensures that your position is always the most comfortable. What is unique about this chair is how it comes along with dual paddles for convenient adjustment and an integrated bar in the back where you can easily reach out for your jacket. It will continue to add comfort to your guests and employees, while always looking sleek and stylish. Lumbar support system keeps your back comfortable for long. Dual paddles make height adjustment very convenient. Integrated bar where you can keep jackets within your reach. Locking tilt mechanism keeps you in an apt position. Might be a little too simple for swanky offices. The material might not last very long. Most users find it hard to believe the kind of quality that is offered at such an affordable price. They love how firm and comfortable the chair is and how they can spend hours without their backs hurting. 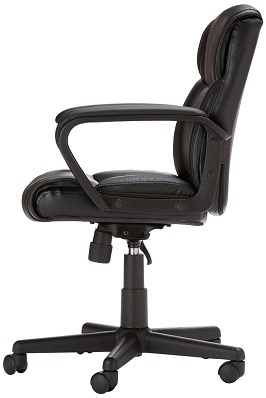 It really is a phenomenal chair as suggested by a majority of users. 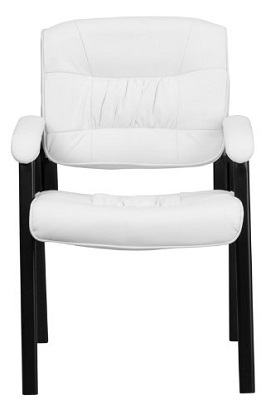 Why opt for White Leather conference chairs? A reception area needs to look inviting and comfortable. 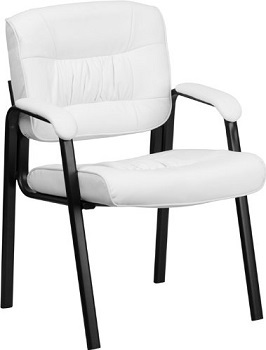 If you have a new office to flaunt, there is nothing like the BT-1404-WH-GG white leather reception chair from Flash Furniture. Its seat and back are thickly padded and will make all your visitors feel at ease while you discuss business with them. Seat and back are thickly padded. Stainless steel frame is durable. The foam might not hold up for long. Not as comfortable as it claims to be. While some users have had a few issues regarding the foam and upholstery, most of the users have recommended this product highly for your reception area. The chair is quite easy to assemble and the price that it comes for is unbelievably worth it. 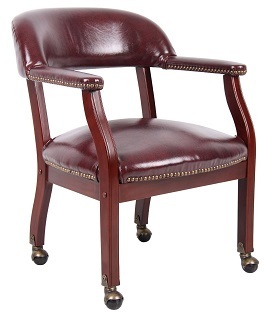 Boss Captain’s Chair in Burgundy Vinyl is your go-to if you are looking for a classy brown leather conference room chairs. It looks classy and is also quite versatile in nature. It can be used as a desk side, in the lounge as well as in the conference room. 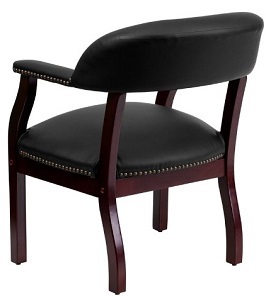 It has a durable hardwood frame with a rich and classy mahogany finish. It has a no-sag spring seat. The hardwood frame is quite durable. The covering is made from burgundy vinyl which is quite easy to care for. The leather might seem too slippery to lean comfortably. Might be a little inconvenient to roll it on the carpet. 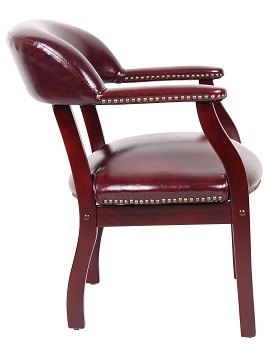 Users have felt that this chair is a true combination of beauty, comfort and affordability. The instructions to assembling the chair are pretty easy to follow and the durability of the chair has been proven time and again by users hardly requiring to fix or repair for longer stretches of time. 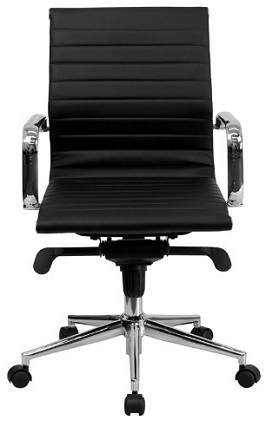 What’s special about High Back Leather Conference Room chairs? Bellezza’s high-backed leather conference room chair will let you relax against its comfortable full-length padded back and the tilt adjustment will let you customize according to your preference. There is a 360 degree swivel ability that offers a whole lot of convenience while working in the office. Ergonomic design keeps you comfortable. Fixed arms keep your feeling at ease for long. The make is very durable with solid wood forming the exterior. The nylon base keeps the chair stable all through. The assembly might take a little longer than expected. The kind of richness that this chair adds to a conference room is what customers really like about this product. They are also quite happy with the price of the chair that is affordable without compromising on the make. A few have said that they could do with a wider seat. 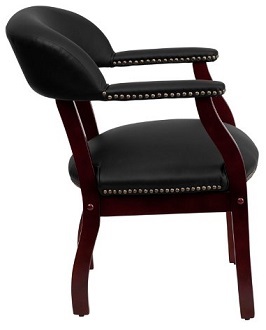 The Black Luxurious leather conference chair from Flash Furniture is about holding up the tradition of the bygone era. Its solid hardwood mahogany frame, the upholstered arms, and the open back design will fill up your reception area, libraries and office rooms elegantly. Hardwood mahogany frame is highly durable. Adds a professional touch to your office environment. Might be a tad too heavy for easy portability. The open back design could be uncomfortable for few. Most users are all in praise of how easy this chair is to assemble. They are also happy with the price at which such a traditional and durable chair is being offered. Users have claimed that if given a choice, they would buy this product the second time as well. 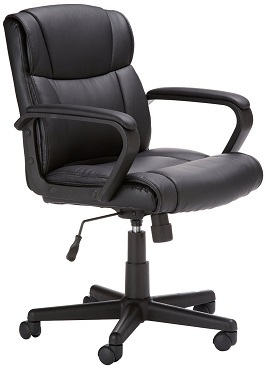 Boss Leather Plus Posture task chair is a your one-stop solution for a cheap conference leather chairs. An armless task chair that is both supportive and comfortable, it also takes good care of your back with an inbuilt lumbar support system. 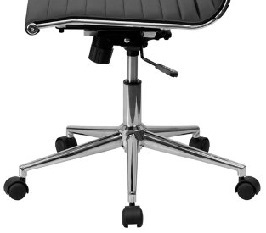 Its 5-star nylon base provides a proper supportive base for easy movement and stability. 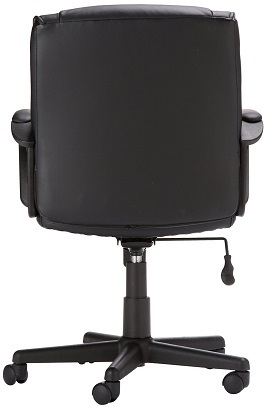 Height and depth of the chair are fully adjustable. Assembly instructions could be a little difficult to process. Majority of users have found this chair to be an incredible piece of furniture, simply because of the way it combines the best features with an affordable price. Amazon Basics promises to offer unhindered comfort to users with its mid back leather office chairs that are ergonomically designed. 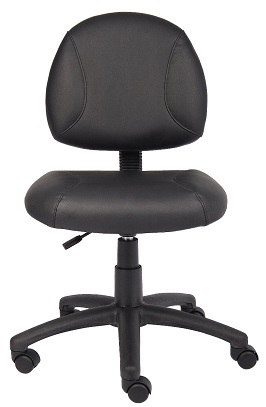 It assures all-day comfort with padded seat and seat-height adjustment features. Its smooth-rolling mobility option keeps you sorted through the day. Dual wheel casters let you move from one end to the other with ease. The padded back keeps you highly comfortable. The fully-adjustable controls come in handy. The fact that there are hardly many users who have anything negative to say about this chair proves the point that it really is a highly preferred product. Almost every user has great reviews to offer about this chair. 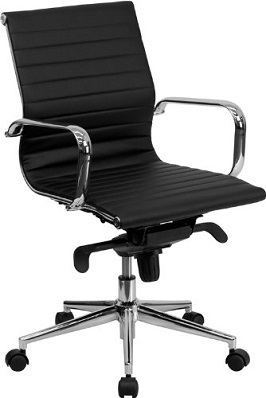 What are leather Conference Room chairs with casters? 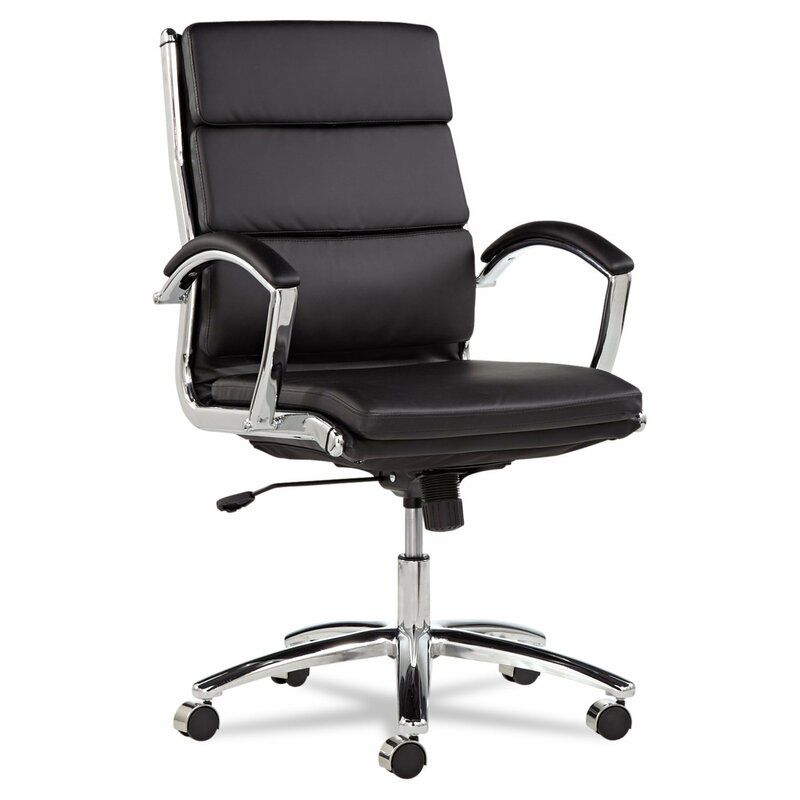 Are you looking for modern leather conference room chairs with casters? 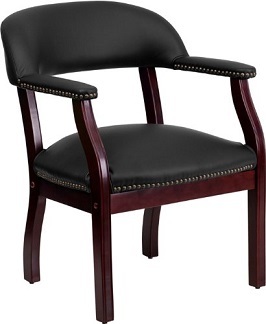 The mid-back armless black ribbed conference chair from Flash Furniture could be your best pick. With casters for easy mobility through the office, getting things done in a jiffy is no longer an issue. Seat and back are highly supportive and comfortable. Has an inbuilt lumbar support system. Casters provided for easy mobility. Might not be as comfortable as its claim. Many users have found this chair to be cosmetically awesome but not ergonomically designed. The height adjustment is a great feature but it does not allow you to recline as much as it should. 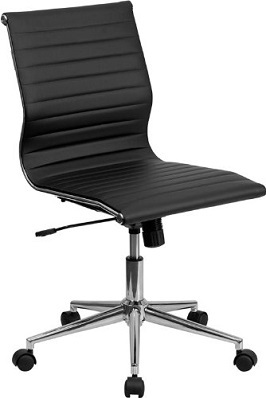 Which are the best leather conference room chairs? Alera Nerotali has come up with the best-in-lass leather conference room chairs that not only have a slim profile, but are also ergonomically designed to ensure better circulation and enhanced comfort. Waterfall seat ensures a comfortable seating. Arm caps padded for more comfort. There might be a few quality control issues. 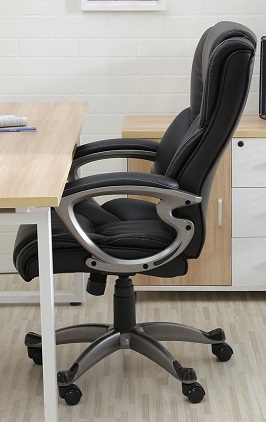 Most users have found this to be a decent chair for office use and the added comfort factor with the waterfall seat and padded arm caps really make this product worth the investment.